The book cover is the first thing your readers are going to see – which is why it is important to have an eye-catching design! In contrast to static PDF documents, these formats are reflowable und customizable by eReaders and, thus, bring much more comfort for readers. 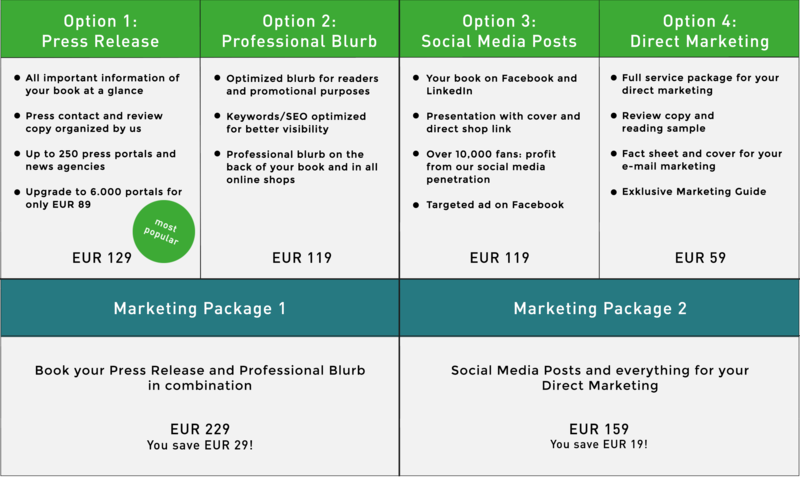 This professional advertising text will be printed on the back cover of your paperback and will also appear as the product description in all online shops. We work together with professional proofreaders who have years of experience and who will thoroughly check your text for mistakes. The costs will be determined by your writing style as well as the complexity of your book. We work together with skilled translators who will translate your academic text into German. Thus, it will be possible to find even more readers for your text through our various German as well as international sales channels and book stores like Amazon.de and ebook.de. The costs will be determined by your writing style and the complexity of your text. Send us your text – we are happy to make you an individual offer.